I had a post (in my mind) for Sunday. I had it ready to go and all I had to do was sit down and write it. But the events of this weekend silenced me. It caused me to step back and think about empathy and compassion. Too many events had happened, starting from Saturday morning to Sunday evening. I wanted to share with you on what they were, I didn’t feel right-at the moment. We were in the mall. The woman’s restroom was closed, due to cleaning. This didn’t bother me because I always have to go use the family room which was separate. Since the restroom was being cleaned, the family room had a line of women who had to use the restroom. It was my turn next to go in. I enter with my children (both in tow) and my husband. There is no changing tables in any other bathroom in the mall. This was it. My daughter is too old to go into the mens bathroom, so they all go in with me, and I tend to each child. Of course this is hard to hear because there is an infant (my son) who is crying because he doesn’t like to be changed in a public restroom, and my daughter who is upset because of the automatic flushing toilet. (something out of a comic book I’m sure). Fully aware of the people who were waiting next in line — which is why I tried to work as fast as I can, while tending to 3 people (myself included). Aware that there were women who had to use the bathroom as badly as I had to. Aware that the women’s restroom was closed–due to cleaning. If she saw me walk in the bathroom with two children — one of them an infant. Aware that she was standing on line at the only family restroom in the mall. Not too long ago, I asked, if were a society that hates kids, but I think the feelings goes deeper than that. What if we are a society that lost compassion and empathy for one another? I’m not saying, because I am a mother with two kids, I deserve to get a pass in life–I don’t. I’m not saying that my situation was worse than hers. I don’t know her story. I don’t know if she was ill or not. She doesn’t know my story. She doesn’t know what I have gone through just minutes before entering the mall, and what I was carrying in my heart. What struck me was that she’s asking me to have consideration for others while screaming over a crying infant who I was changing. All through the web, and when I open the Bible, I’m reminded that our words can tear a person down our build them up. I am reminded of the power of our words. We throw out phrases like: consideration, sympathy, empathy, but I sense these are just key words. Words that we have to remember without actually exercising their meaning. These don’t mean the same thing! We can be sensitive towards another person, but that doesn’t mean we care about their lot. We don’t have to care about what they are going through, we just have to consider it–think about it; but it doesn’t require action. Empathy is where true human connection happen. I understand what you are going through, I know what those feelings are. What can I do to help you? This all happens after you thought about the other person’s situation. As I come across other people in life–the elderly, pregnant women, families. I can understand. I don’t expect a woman with a cane to move as fast as I would. I don’t expect a mother who is with an infant to be super quick while changing them. I don’t expect a parent with a crying child in a toy store to be serene and calm and say, “No Billy, we are not getting that.” with a sweet voice without screaming. I understand. I consider their situation. I put my self in their shoes and I empathize with what they are feeling. I then have compassion for them, because they are not alone, and I do what I can do for them to understand that. Instead of asking myself are we a society that hates kids, I need to ask, did we lose compassion for one another. Did we lose our ability to empathize with one another? Are we more self-centered and only concerned with our wants and desires, and needs? Are we serving ourselves, mankind, or God with our actions and deeds. Did we stop caring about the greater good? There were tons of things that I could have said to her when I opened the door. There were many thing that were on the tip of my tongue, that would have been true (and appropriate) to say without me feeling guilty afterwards. But I didn’t say any of those things. I asked her, if she saw the kid, and the infant? I asked her if she saw that it was the only family restroom in the mall she was complaining about. I asked without anger, but I asked with a questioning voice. She didn’t answer any of those questions; she stayed silent. I didn’t wait to press her for answers. Deep down, I knew she didn’t have the answers. 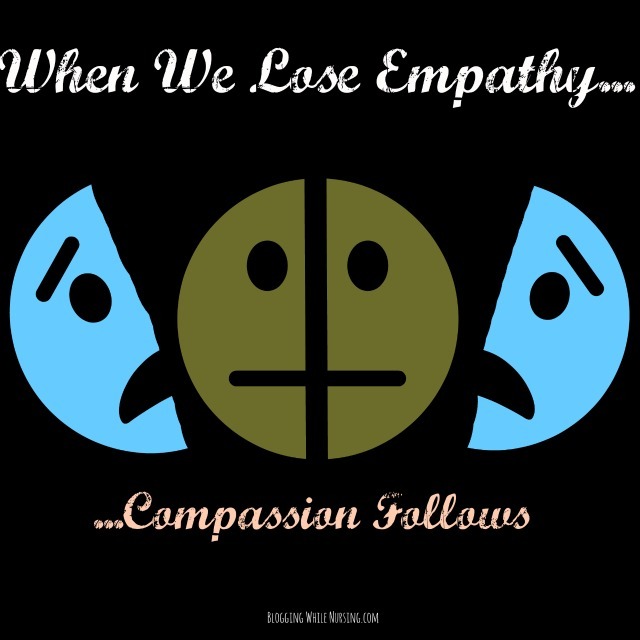 19 Comments on "When We Lose Empathy, Compassion Follows"
It’s hard, people are mostly self absorbed. Thanks for a thought provoking post about consideration of others. You are very welcome Lisa. This event had left me feeling so dejected, but I know that there are people out there who are caring, and who wouldn’t have done what she did. I’m sorry that you had to deal with this! As a mom with little ones, I feel for you, feel with you, on SO many levels! I think it’s the individualistic nature of our country that makes it seem okay, to some, to not be compassionate, empathic, considerate. It’s a shame. Thank you Jessica for your words and total understanding! I’m so sorry that I didn’t reply to this earlier (although I thought I had). Our country and mindset has been moving to more of the individualistic nature- as you have stated. I was taking to another person on Google+ about this, and they mentioned that all is not lost. With this coming up generation, and them seeing how things are going they will try and change this to balance everything–like every generation before has done differently than the past generation. Sorry that you had to go through this Kalley, but through all of this, I still say you did the right thing. People can be very mean and lack consideration and empathy for others, until that is, when their turn comes around. Be encourage to know that God is on your side and He be for you who can be against you? Thank You Yvonne! I’m sorry that I am just replying to this, I must find out what happened to my comments since updated my WordPress. But thank you. No one really does like it when things happen to us, even if it is Karma. I know that deep down it was a teachable moment for my daughter. As you said, you don’t know what she had been through, nor did she know your situation. I tell myself at times like this that that person is probably hurting, if they are so rude to a stranger, and that they too need compassion. I wish we saw more compassionate actions…. I also like “Namaste” as a mantra for compassion, about seeing the divine light in all. Thank you so much Sarah for your thoughts. It’s very true I don’t know where she was coming from- nor her me. The most that I can do for her is pray that she finds peace and of course forgive her. I am SO sorry this happened to you! So many folks don’t have enough compassion—just the fact that the baby was crying should have been enough to shut them up. Ugh. This really boils me! You had to do what you had to do, and I get that. Most normal people get that! Thank you Nellie for your understanding. I don’t know what she was coming from or thinking but I’m glad that it’s behind me. All I can do is pray that she receives some sort of peace. Blessings. You are a dear mama.